Play Contests – Players can select from a number of contests with a “gold entry fee”. Gold Betting – Answer match questions using gold and earn more gold or experience. Win a Vulcun Jackpot – Win Counterstrike skins and stickers or huge amounts of gold playing the Vulcun “Jackpot”. Play Vulcun with the Pros – Bid against others with gold using their “auction platform” for a chance to play games with eSports pros. Right now “gold” works kind of like a reward system for players. It is a neat idea, but we would really like to see a real rewards system that can earn tickets to real money games or substantial prizes such as trips and tickets to e-sports events. 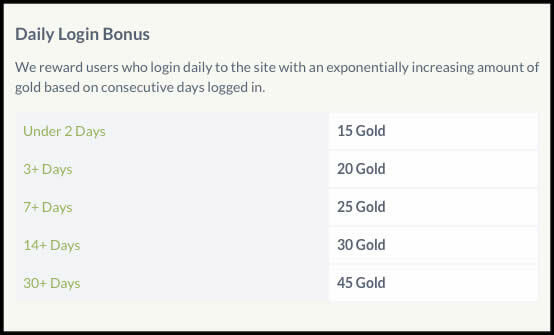 As fantasy esports grows, I am sure that the Gold reward system at Vulcun will evolve into just that, but until then, it is a nice little perk for users to keep logging into their accounts each day so that Vulcun can advertise their daily contests and promotions. For a gold match at Vulcun remember to use the official promo code VBONUS. New players using the code will get $5000 free gold added to their account and 15 extra loot crates to open. The code will also get you a 100% match bonus on any gold purchases. 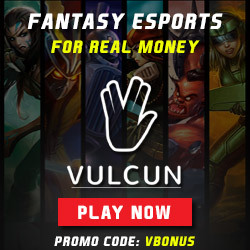 Don’t hesitate it’s time to play fantasy esports games at Vulcun.com.